When we clean our cars or get it cleaned professionally many people do not know why their car end up with hairline scratches and swirls. Those swirls almost looks like someone washed the car with steel wool. But that is not the case. One way to improve the appearance of your car after having such fine scratches are to use high quality car polish. However, after a while they will appear again. That is because the car polish do not really remove them. Also remember that car polish removes a layer of paint from your car. 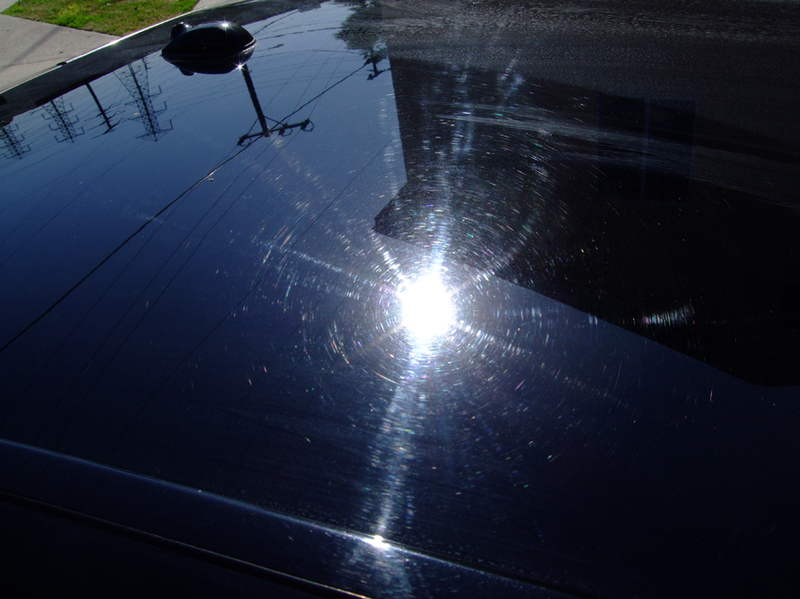 A new car also have a very thin layer of UV protection, which poor quality and cheap polish will remove! Ditch the spunge! Yes ditch it! It is the number one cause for swirls and hairline scratches. Fine dust and dirt that may have been left over after rinsing your vehicle, or may be even part of the water you used gets trapped between the spunge and the paintwork. This dirt or dust particles acts as sandpaper, and you know what sandpaper will do, don’t you! Regularly rinse the cloth you use to wash your car. Yes that means that you need to have a second bucket with clean water. You have to rinse your mitt regularly. Do a panel at a time and rinse before continuing! If you already have ENJO Outdoor Glove, then you are lucky, because you need one bucket of clean water to rinse the glove after washing each panel! If you can invest in a grit guard for your bucket, then that will help for the grit particles not to mix with water during each rinse of your cloth or ENJO Outdoor Glove. Do not use household detergents, such as dishwashing liquid. It will strip the protective layer on your paintwork, and expose your vehicle to the elements. This is why paint turn dull over time! Since ENJO only uses water, it will make this layer last much longer! Always wash from top to bottom to ensure grit and dirt is washed down off from your paintwork. If you go to a professional car wash, avoid those that are automatic, as those brushes can scatch your paintwork. Ensure that the manual car was uses the correct detergent for your vehicle, and not something that will remove your protective layer! Use a seperate mitt or cloth for your mag wheels, and if you have the ENJO Flexi, you can use the that to enter the hard to reach and small areas inside the mags. Even though ENJO do not transfer grit or dirt, it is also safe to use the ENJO Outdoor Glove on the mags, but only after the entire vehicle is washed. Do not use household brushes, scourers, or pads to remove stubborn marks on paintwork. Use appropriate solutions such as the ENJO Outdoor Glove and a little patience. If you do not have ENJO you can find chemical solutions to help you with the job, but continued use of such chemicals are not the best for your car. To remove bird much, hold the wet ENJO Outdoor Glove on the bird much for a short while so that the water can seep into it and soften it. Then gently wipe with the Glove until it is removed, rinsing the Glove as required. Use the Outdoor ENJOfil to dry your car. It is soft and specially woven with a zig zag pattern to assist in trapping any further dirt particles left over from the washing process. Do not press hard when drying, but do so gently. One ENJOfil should be sufficient to dry one vehicle without leaving streaks or fluff. Using a chamois simply do not possess this feature to trap dirt or grit particles like the ENJOfil does, thus you will risk causing scratches and swirls when using a chamois! Even though there are many other tips that are also important, these are the top 10 car washing tips that will ensure that your car will be properly taken care of! If your paintwork already have these scratches, unfortunately there is not much you can do, other than avoiding further damage, and using polish. Polish do not remove them, it basically covers it up. We hope you have found these tips useful, and should you require further information on using ENJO to take care of your car, feel free to contact us for any questions you may have!